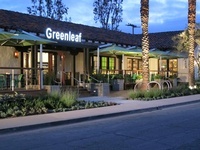 Greenleaf provides our communities with the highest quality, freshest and most delicious food that is also good for you. We say: “Eat Well. Live Well.” We are committed to using the finest and freshest local ingredients combined with gourmet cooking techniques to serve our customers an affordable yet creative dining option in a fun, comfortable, and relaxed environment. Using the best ingredients to create everything from salads and juices to starters and entrees.